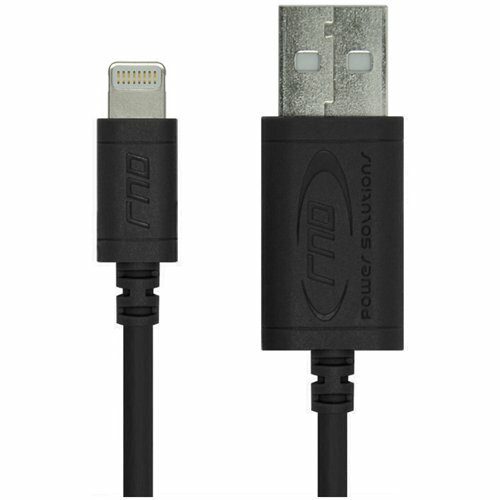 Use RND Power Solutions 8-Pin Lightning to USB (1.5ft) Cable to charge and sync your iPhone, iPod, iPad, to your Mac or Windows. Compatible with all Apple iOS and iTunes versions.Apple Certified (MFI) Made for iPhone, iPad, iPod licensed program Our premium lightning cable is Apple Certified and meets Apples high manufacturing standards - MFi (Made for iPhone) Our products are part of Apple MFi program which use Apple's licensed technology to connect your devices safely and are compatible with IOS updates. Our lightning connectors have an Authentication Chip from Apple CertificationsAll cables are Apple certified (MFI), RoHS compliant, and CE Certificate/AuthorityRoHS compliant ensures dangerous substances commonly used in electronic and electronic equipment are not used. The CE marking is the manufacturer’s declaration that the product meets the requirements of the applicable EC directives.Performance (Sync and Charge)The cable is made with the highest quality plastic, copper shielding, and nickel plated connectors to ensure fast, stable, and reliable data connections while syncing. Slim Design for the best fit.Our slim lightning connector allows it to be used with the majority of cases including Otterbox and Lifeproof.ConvenienceOur cable can help you charge or sync data by simply plugging into a charger, PC, or Mac USB Outlet.Compatible with but NOT limited to:- Apple iPhone 7- Apple iPhone 7 Plus- Apple iPhone 6S- Apple iPhone 6S Plus- Apple iPhone 6 Plus- Apple iPhone 6- Apple iPhone 5- Apple iPhone 5C- Apple iPhone 5S- Apple iPhone SE (Special Edition) - Apple iPad Pro- Apple iPad Mini- Apple iPad Air- Apple iPod Touch- Apple iPod nano- Apple Siri Remote- Beats Pill+Cable Specifications:- Color: Black- Length: 1.5 feet / .5 Meter.- Connector 1: Apple Lightning Connector (Reversible) - Connector 2: USB- Apple MFi certified (Made for iPhone, iPad, iPod). - RoHS, CE, FCC, compliantProfessional Retail PackagingRND Power Solutions products comes in professional retail packaging. Authentic RND Power Solutions products will have our branding on the product and packaging.100% GUARANTEED100 percent satisfaction guaranteed! Backed by RND Power Solutions 1-Year hassle free warranty. If you have any questions about this product by RND Power Solutions, contact us by completing and submitting the form below. If you are looking for a specif part number, please include it with your message.